Introduction: A child's intelligence quotient (IQ) is determined by both genetic and environmental factors that start from the prenatal period itself. There is a lack of data on the factors which influence IQ in Indian children; therefore, we conducted a multicenter questionnaire-based study to determine the environmental factors which influence IQ in Indian children. Participants and Methods: In this cross-sectional observational study, we recruited 1065 schoolchildren between the age of 12 and 16 years from 2 government and 13 private schools in 5 towns, 6 cities, and 2 villages across India. All the children were administered a questionnaire consisting of various environmental factors such as parents' education, occupation, income, and the physical activity of the students. IQ scores were assessed using Ravens Standard Progressive Matrices. An approximate IQ score was calculated using the score on the Ravens test. IQ scores were divided into three groups: below normal IQ (0–79), normal IQ (80–119), and high IQ (above 120). The data were analyzed using SPSS software. Results: In this study, it was observed that the environmental factors such as place of residence, physical activity, family income, parental education, and occupation of the father had an impact on the IQ of the children. Children living in cities (P = 0.001), children having physical activity more than 5 h/weeks (P = 0.001), children with parents having a postgraduate or graduate level of education (P = 0.001), children whose father having a professional job (P = 0.001), and those with a higher family income (P = 0.001) were more likely to have high IQ. Conclusions: In the present study, we found that various environmental factors such as place of residence, physical exercise, family income, parents' occupation and education influence the IQ of a child to a great extent. Hence, a child must be provided with an optimal environment to be able to develop to his/her full genetic potential. Just like any other human trait, intelligence varies from person to person. Individuals differ in intelligence due to differences in both their environments and genetic heritage. Most studies estimate that the heritability of intelligence quotient (IQ) is somewhere between 0.30 and 0.75. This indicates that genetics plays a bigger role than environment in creating IQ differences among individuals. However, members of the same family also tend to differ substantially in intelligence (by an average of about 12 IQ points). Studies on the influence of gene–environment interaction on intelligence have shown that genetic and shared environmental components change in opposite directions as a function of socioeconomic status (SES), i.e., the heritability of IQ is very low for lower SES individuals and vice versa. The most probable explanation for this could be that children in poverty do not get to develop to their full genetic potential. The IQ difference between children adopted by upper-middle-class parents and those adopted by lower SES parents was observed to be approximately 12 points. Among the social factors affecting intelligence, the school the child goes to seems to have quite a major influence on IQ. Surprisingly, the quality of teaching in kindergarten and first-grade teaching also plays a role. Although the academic gains due to having more experienced teachers fade away in later grades, the noncognitive gains persist. There is a lack of data on the factors which influence IQ in Indian children; therefore, we conducted a multicenter questionnaire-based study to determine the environmental factors which influence IQ in Indian children. In this cross-sectional observational study, we recruited 1065 schoolchildren between the age of 12 and 16 years from 2 government and 13 private schools in 5 towns, 6 cities, and 2 villages across India. Children <12 years and >16 years of age, children with learning disabilities, and those who were not willing to participate were excluded from the study. The schools for inclusion in this study were selected randomly, and both government and private schools were selected as per convenience. Permission from the school authorities was obtained for administering the questionnaire of the students and they were explained in detail about the procedure and the implications of the study. The classrooms were chosen randomly, and from classes, students were selected according to the inclusion and exclusion criteria mentioned above. Demographic characteristics of each participant such as age and gender were recorded. This study was conducted by medical students. 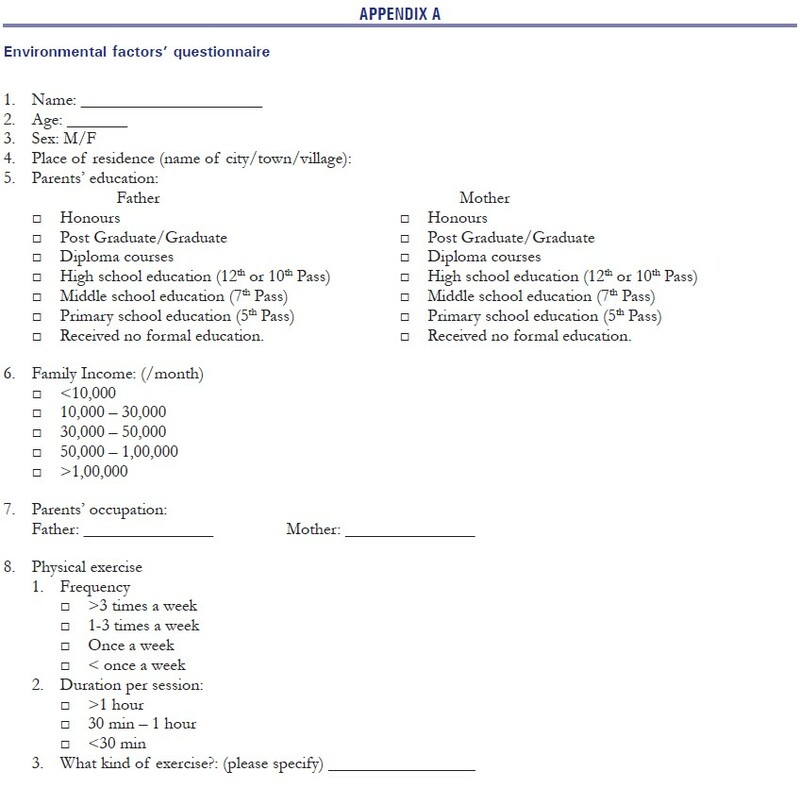 A questionnaire consisting of various environmental factors such as parents' education, occupation, income, and physical activity of the student [Appendix A] [Additional file 1] was used. The questionnaire was made in English and translated into Hindi without any loss of meaning of the questionnaire during translation. The participants were administered the questionnaire as per their choice. All participants were explained about the questionnaire and they filled up the questionnaire themselves. For the assessment of IQ scores, Ravens Standard Progressive Matrices were used. It is a multiple choice type of a questionnaire consisting of sixty questions. There is no language barrier in this test as it uses only figures. Hence, no translation was required. The eligible participants were made to fill up the environmental factors' questionnaire first. Thereafter, they were asked to solve the Ravens test, and the time in which they completed that test was also noted. An approximate IQ score was calculated using the score on the Ravens test. IQ scores were divided into three groups: below normal IQ (0–79), normal IQ (80–119), and high IQ (above 120). The data were analyzed using SPSS software analyzed using IBM SPSS package for Microsoft Windows Version 22.0 (Armonk, NY:IBM Corp.). Qualitative data were analyzed using Chi-square test, and P< 0.05 was considered statistically significant. In this study, the IQ and environmental factors of 1065 students were assessed by a questionnaire. The mean age of the 1065 students was 14.1 ± 1.3 years and 596 (56.1%) students were males. 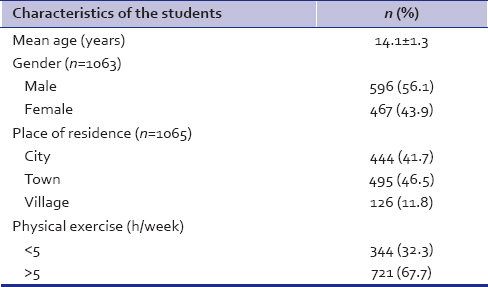 The demographic details of the students have been summarized in [Table 1]. The demographic details of the families of these 1065 students have been summarized in [Table 2]. 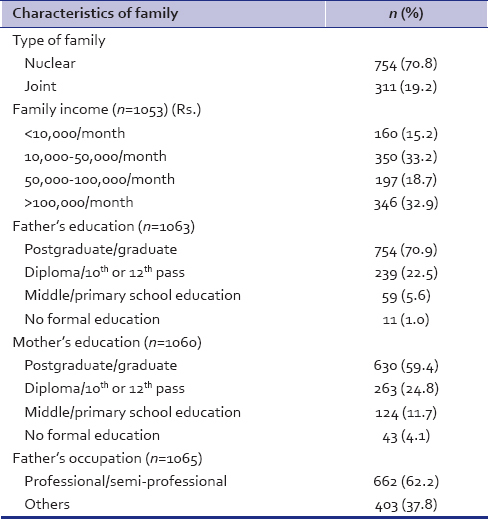 Of the 1065 students, 754 (70.8%) came from nuclear families while the rest came from joint families [Table 2]. 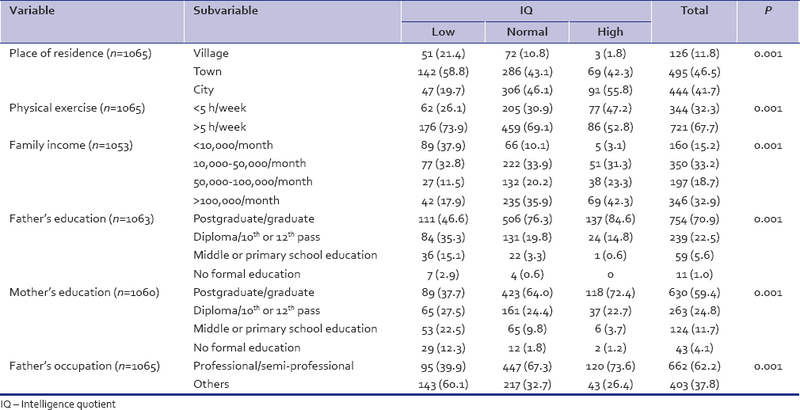 The association of IQ with their place of residence of children is shown in [Table 3]. Most children with high IQ were residing either in cities (55.8%) or towns (42.3%) than those living in villages (1.8%) (P = 0.001). Out of the 163 people in the high IQ group, more than 50% engaged in some form of physical exercise for more than 5 h a week. Children engaged in physical exercise for more than 5 h a week had more often normal IQ in comparison to those performing physical exercise of <5 h (69.1% vs. 30.9%; P= 0.001) [Table 3]. Almost half (50.7%) of the children with low IQ came from families with income <Rs. 50,000/month. On the other hand, 65.6% of children with high IQ came from families with more than Rs. 50,000/month (P = 0.001) [Table 3]. Of 162 students with high IQ, 137 (84.6%) students had fathers who were either postgraduates or graduates while none of them had fathers who were not educated at all. The number of fathers having postgraduate or a graduate degree was significantly higher in children with high IQ group than in those with low IQ group (84.6% vs. 46.6%; P= 0.001) [Table 3]. Similarly, mothers of 118 (72.4%) children with high IQ were postgraduate or graduate and only two (1.2%) students with high IQ had mothers who had no formal education. On the other hand, in the low IQ group, only 89 (37.7%) students had mothers who were graduates/postgraduates (P = 0.001) [Table 3]. Among children with high IQ, 120 (73.6%) of them had fathers working as professionals or semi-professionals. While out of the 238 students in the low IQ group, only 95 (39.9%) had their fathers working as professionals or semi-professionals (P = 0.001) [Table 3]. In this study including 1065 schoolgoing children, we observed that the environmental factors such as place of residence, physical activity, family income, education of the mother and father, and occupation of the father had an impact on the IQ of the children. Children living in cities, children having physical activity more than 5 h/week, children with parents having a postgraduate or graduate level of education, and children whose father working as a professional were more likely to have high IQ. Similar to most other traits, intelligence is also inheritable; the heritability of intelligence varies from 0.30to 0.75. While there is a potential for high intelligence, it is not necessary that everyone will reach the upper limit of their genetic potential. A variety of the components, of the social environment the child is exposed to right from his/her conception, determine the ultimate intelligence of a person. In a study from India, the scholastic performance, IQ and scores of mental balance, attention and concentration, verbal memory, and recognition were found to be lower in iron-deficient girls, both anemic and nonanemic, as compared to the noniron-deficient girls. We, in the present study, observed that the education of both mother and the father had a positive effect on IQ of the children. The beneficial effects of parental educational level are not limited to academic achievement through the school years but have long-term implications in the form of indirect effects (adolescent aspirations and educational achievement) also. Family income is also one of the major determinants of a child's intelligence. A higher family income implies good schooling for the child and also every possible level of cognitive stimulation can be made available to the child. In such cases, the child gets better chances to reach his/her full genetic potential in terms of intelligence. The same is true for parents' occupation and educational qualification which are mostly related. High educational qualification ensures a dignified occupation and therefore high family incomes. All these point toward more chances of children with IQ on the higher side. Another way in which occupation is important is in determining the amount of time parents spend with their children. The more family time together, more is the cognitive stimulation of children. Thus, all these environmental factors as brought out in our study are interrelated and together play a role in determining a child's intelligence. While the present study has certain merits including inclusion of a large number of children from many parts of the country, there are certain limitations too. We did not give the Ravens test to parents or grandparents and therefore our study did not establish the heritability of intelligence. The number of villages, towns, and cities covered was not proportionate. Therefore, the data obtained in our study are not representative of the country. We, in the study including 1065 schoolgoing students, found that various environmental factors such as place of residence, physical exercise, family income, and parents' occupation and education influence the IQ of a child to a great extent. Hence, a child must be provided with an optimal environment to be able to develop to his/her full genetic potential. Gottfredson LS. Mainstream science on intelligence: An editorial with 52 signatories, history, and bibliography. Intelligence 1997;24:13-23. Nisbett RE, Aronson J, Blair C, Dickens W, Flynn J, Halpern DF, et al. Intelligence: New findings and theoretical developments. Am Psychol 2012;67:130-59. DiLalla LF. Development of intelligence: Current research and theories. J Sch Psychol 2000;38:3-7. Davies G, Tenesa A, Payton A, Yang J, Harris SE, Liewald D, et al. Genome-wide association studies establish that human intelligence is highly heritable and polygenic. Mol Psychiatry 2011;16:996-1005. Galton F. The history of twins, as a criterion of the relative powers of nature and nurture (1,2). Int J Epidemiol 2012;41:905-11. Der G, Batty GD, Deary IJ. Effect of breast feeding on intelligence in children: Prospective study, sibling pairs analysis, and meta-analysis. BMJ 2006;333:945. More S, Shivkumar VB, Gangane N, Shende S. Effects of iron deficiency on cognitive function in school going adolescent females in rural area of central India. Anemia 2013;2013:819136. Conklin SM, Gianaros PJ, Brown SM, Yao JK, Hariri AR, Manuck SB, et al. Long-chain omega-3 fatty acid intake is associated positively with corticolimbic gray matter volume in healthy adults. Neurosci Lett 2007;421:209-12. Warsito O, Khomsan A, Hernawati N, Anwar F. Relationship between nutritional status, psychosocial stimulation, and cognitive development in preschool children in Indonesia. Nutr Res Pract 2012;6:451-7. Dubow EF, Boxer P, Huesmann LR. Long-term effects of parents' education on children's educational and occupational success: Mediation by family interactions, child aggression, and teenage aspirations. Merrill Palmer Q (Wayne State Univ Press) 2009;55:224-49. Maurin E. The impact of parental income on early schooling transitions: A re-examination using data over three generations. J Public Econ 2002;85:301-32. Baghurst PA, McMichael AJ, Wigg NR, Vimpani GV, Robertson EF, Roberts RJ, et al. Environmental exposure to lead and children's intelligence at the age of seven years. The Port Pirie Cohort Study. N Engl J Med 1992;327:1279-84. Wasserman GA, Liu X, Lolacono NJ, Factor-Litvak P, Kline JK, Popovac D, et al. Lead exposure and intelligence in 7-year-old children: The Yugoslavia Prospective Study. Environ Health Perspect 1997;105:956-62. Neisser U, Boodoo G, Bouchard TJ Jr., Boykin AW, Brody N, Ceci SJ, et al. Intelligence: Knowns and unknowns. Am Psychol 1996;51:77-100.
índer A, Gülay H. Reliability and validity of parenting styles & dimensions questionnaire. Procedia Soc Behav Sci 2009;1:508-14. Sameroff AJ, Seifer R, Baldwin A, Baldwin C. Stability of intelligence from preschool to adolescence: The influence of social and family risk factors. Child Dev 1993;64:80-97. Black SE, Devereux PJ, Salvanes KG. Small family, smart family? Family size and the IQ scores of young men. J Hum Res 2010;45:33-58. Retherford RD, Sewell WH. Intelligence and family size reconsidered. Soc Biol 1988;35:1-40. Ceci SJ. How much does schooling influence general intelligence and its cognitive components? A reassessment of the evidence. Dev Psychol 1991;27:703-22. Tomporowski PD, Davis CL, Miller PH, Naglieri JA. Exercise and children's intelligence, cognition, and academic achievement. Educ Psychol Rev 2008;20:111-31. O'Dea JW. The Effect of Extra-curricular Activities on Academic Achievement (Doctoral Dissertation, Drake University); 1994. Lekies KS, Cochran M. Collaborating for Kids. New York State Universal Prekindergarten 1999-2000.